FLOWERY BRANCH, Ga. (AP) — The Atlanta Falcons will be searching for the final piece of the offensive line charged with protecting Matt Ryan when they open their preseason schedule at the New York Jets. Right guard is the only position on the line without a set starter, and that will be a key competition coach Dan Quinn will be watching closely in Friday night’s game. Decisions also have to be made at fullback and defensive end. Protecting Ryan, the 2016 NFL MVP with a new five-year contract extension that could be worth as much as $150 million, makes finding the best starting right guard a priority. Wes Schweitzer was listed ahead of Brandon Fusco, perhaps Atlanta’s top free-agent acquisition this offseason, at right guard on the team’s first depth chart released this week. The two have rotated with the first-team offense during training camp. Schweitzer’s expected start against the Jets may be based on his 16 starts with Atlanta last season. Fusco started all 16 games for San Francisco last season. “I just want to build continuity with everyone, get comfortable with everyone and with this offense,” Fusco said following Wednesday’s practice. Ricky Ortiz is expected to start ahead of Luke McNitt at fullback. The remaining competitions on offense are for backup roles, including a third running back behind Devonta Freeman and Tevin Coleman. Candidates include rookie Ito Smith and Terrence Magee. 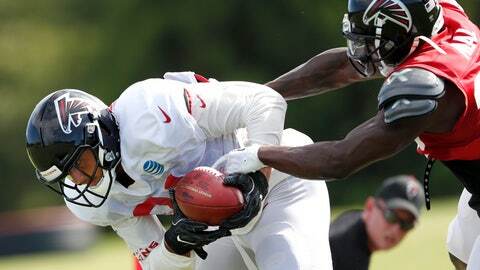 Coach Dan Quinn also is looking at tight ends competing behind projected starter Austin Hooper. Eric Saubert, a fifth-round pick in 2017 who had no catches as a rookie, has impressed the coach in camp. “He’s somebody who certainly has our attention at tight end,” Quinn said Wednesday. The Falcons did not re-sign tight end Levine Toilolo, who is now with Detroit. Veteran Logan Paulsen is best known for his blocking skills. That leaves an opening for Saubert to emerge as another target for quarterback Matt Ryan. Saubert must do more than show his skills as a receiver. All players competing for backup spots, including at running back and tight end, must prove they can contribute on special teams. Second-year defensive end Takkarist McKinley , trying to earn a starting role, is expected to play after being limited for about a week with a bruised right shoulder. McKinley returned for full participation on Tuesday and Wednesday. NOTES: LG Andy Levitre and his wife, Katie, who carried pink and blue balloons, had a unique baby gender reveal following practice. With players standing around the couple, Levitre held a sign that said “A Gatorade shower will let us see.” Other offensive linemen poured two coolers filled with the blue sports drink over Levitre’s head — so he and his wife are expecting a boy. Players then cheered. … Quinn confirmed PK Matt Bryant (undisclosed injury) and OT Ty Sambrailo (right hand) will not play against the Jets. “We’ll get them back into the fold next week,” Quinn said.